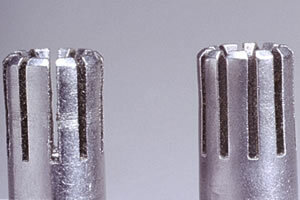 Precision deburring is the removal of sharp particles or edges often left on parts as a result of machining operations. MicroBlasting delivers pinpoint accuracy that allows you to attack a burr at its root without causing dimensional changes to the part. 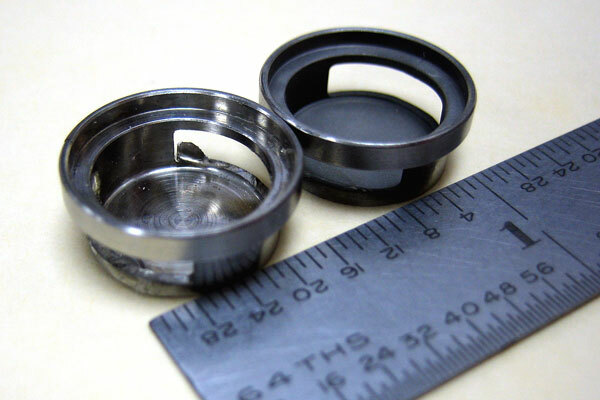 Cutting tools and grinding wheels tend to leave burrs on machined components. 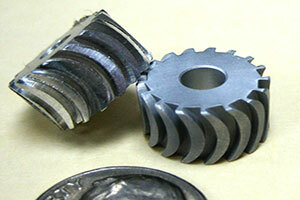 There are two types of burrs that appear during machining: rollover (or feather) and Poisson. MicroBlasting is far more effective at removing a rollover burr. Abrasive can strike the brittle root and chips off the rollover burr quickly without damage to the base material. A Poisson burr tends to be more ductile and tends to take the base material with it during erosion. This burr forms by smooshing an edge, usually the result of a blunt force contact. For example, hit the edge of a piece of metal with a hammer. The thick lip or burr that appears on the part edge is a Poisson burr. The image below shows a typical Poisson burr. A rollover burr forms when an edge is smeared. Rollover burrs erupt when metal fails to fully shear away from the part during machining. A feather burr is just a small, dangly rollover burr. A feather burr appears at the center of the part in the image below. A part’s material determines the proper attack on the burr. Hard components made from stainless, titanium or tool steel require a different approach than much softer polymers like PEEK and nylon. Every abrasive available to MicroBlasting has unique characteristics; therefore, successful deburring relies on the abrasive selection. Depending on the size of the burr, aluminum oxide is usually the best abrasive for deburring hard metals. Aluminum oxide tends to deburr much faster with less risk of corner damage, and it leaves a matte finish. Glass bead and sodium bicarbonate are also acceptable abrasive options in some cases. Sodium bicarbonate gently cuts through the root of burrs found on this ductile material. Sodium bicarbonate particles have a monoclinic shape, which helps it cut through burrs, but it is too soft to cut beyond the burr and damage the part surface. Ground edges sometimes feature brittle regions, and corners present challenges to any machinist. If a cutting instrument has a ground edge, brittle region removal significantly extends the useful life of the tool. Deburring, honing or cutting an edge without dulling it is a challenge. Sodium bicarbonate is usually the best choice for this application. It is hard enough to knock off the brittle layer but lacks the energy needed to cut into the ductile base material. 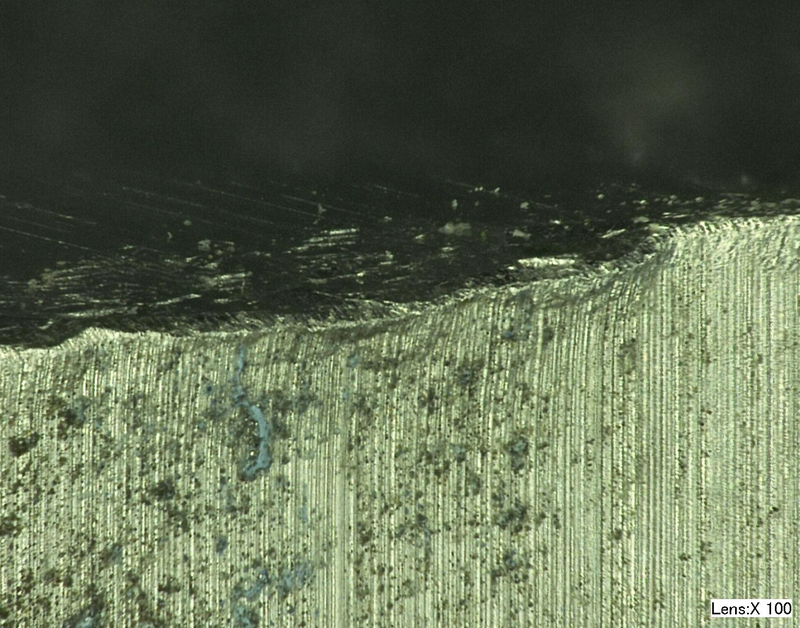 MicroBlasting is generally used to target a brittle burr on a more ductile part. The difference in material properties provides a buffer to avoid overblasting and damage to the part. Deburring is usually performed by a single operator which opens the door to part-to-part variation. Thanks to its inherent precision, MicroBlasting is less dependent on operator skill than other deburring methods. 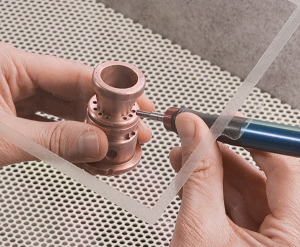 Comco systems are used to deburr cross-drilled holes, delicate materials and more. 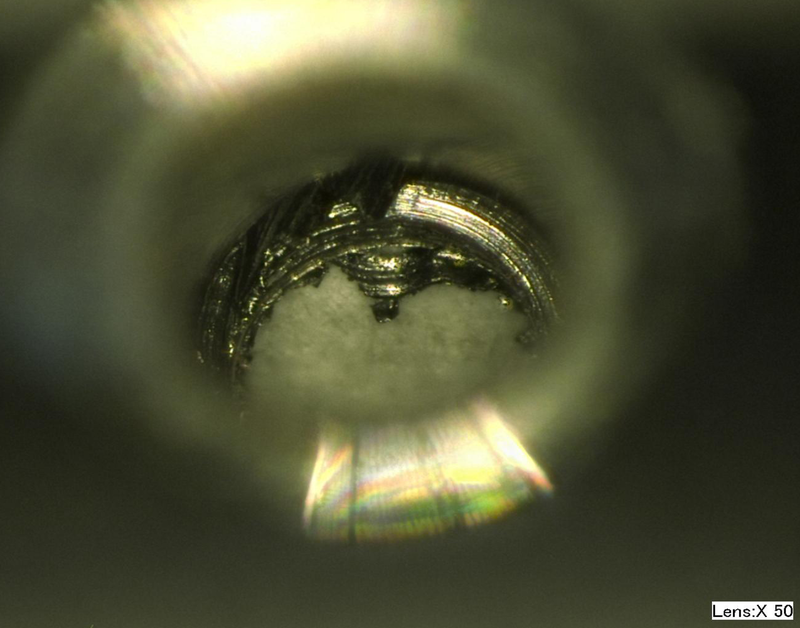 Our blog, Micro-Lessons in MicroBlasting, digs into the how-to of a few common deburring applications. Need a burr-free surface with no edge break? Precise and controllable, micro-precision sandblasting is used across the aerospace industry to refine surfaces on small precision parts with cross-drilled holes and varying bore sizes. This carbon or graphite-filled material easily discolors or roughens, even when using mild abrasives. Wheat starch removes burrs without changing the dimensional or aesthetic integrity of black PEEK. See the results in this post. MicroBlasting takes advantage of the natural dexterity of the human hand, unencumbered by a heavy glove, and the operator’s ability to only target problem areas. The random nature of burr location on a part presents a challenge to automate efficiently. When volume absolutely requires automation, all parts must be treated as worst-case scenarios or sorted into different levels by locations of burrs. The AccuFlo® is our latest MicroBlaster, and it is our most powerful and precise to date. 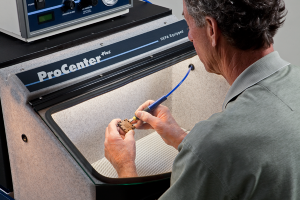 The ProCenter Plus™ is our combination workstation and dust collection system. Together, these two components form the ideal manual MicroBlasting system that suits most deburring applications. 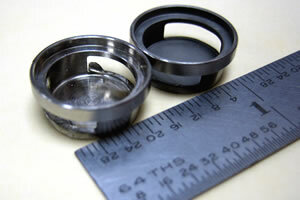 An optional magnifier is available to increase burr visibility and improve operator comfort. The most important component in automated MicroBlasting systems is the tooling used to accurately fixture parts in the abrasive stream. Comco’s automated systems offer a modular design that can handle multiple part geometries. Automating with multiple tooling platforms improve operator efficiency. One fixture can be loaded while the other is being processed. Downtime only occurs during the fixture swap-out. Atomizing nozzles help operators emit a fog when cooling industrial equipment. 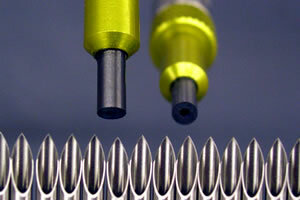 Burrs tend to form during machining at the intersection of the center bore and the expansion chamber on an atomizing spray nozzle. The slightest burr impedes nozzle performance and turns the cooling fog into a watery stream. 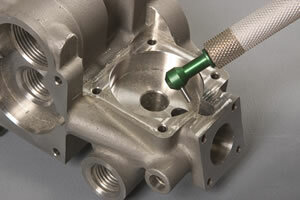 Common deburring methods are ineffective due to the spray nozzle’s design and tight tolerances. However, the focused abrasive stream of a micro-abrasive blaster carves a natural transition between the nozzle’s two regions. This smooth flow path increases nozzle performance. Aluminum Oxide is a cutting abrasive most commonly used for this deburring application. The hard, blocky nature of Aluminum Oxide quickly strikes the burr with enough force to break it off at its root. Each nozzle only requires a few seconds of blasting. 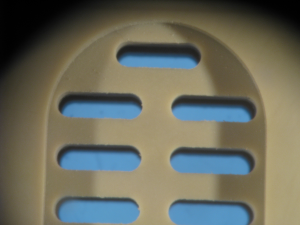 Thanks to its biocompatibility, PEEK is a staple in the medical device industry. 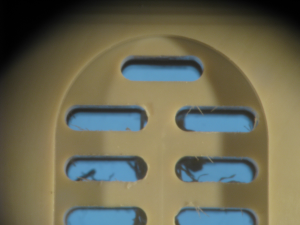 Though easily machined, PEEK develops fine feather burrs in the process. All burrs must be removed during the manufacturing process for the device to function properly and meet the requirements of the FDA. 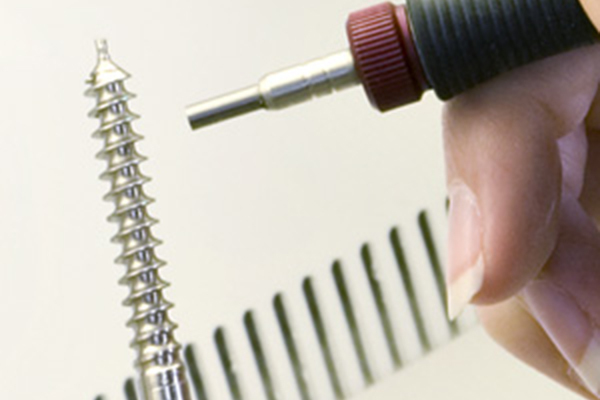 Spinal implants are intricately machined with features designed to improve the rate and the strength of integration between the implant and human tissue. The more complex the design, the more burrs are likely to appear. Traditionally, these burrs are removed by hand using picks and knives under a microscope by highly skilled operators. Since PEEK is an expensive raw material, any slip of the hand results in a costly mistake. 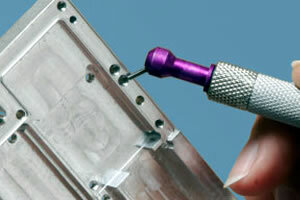 MicroBlasting cuts down on time and eliminates most of the risk associated with deburring PEEK. Unlike a knife, a rich abrasive stream at a low pressure follows the contours of the implant, covering a wider area in a single pass. 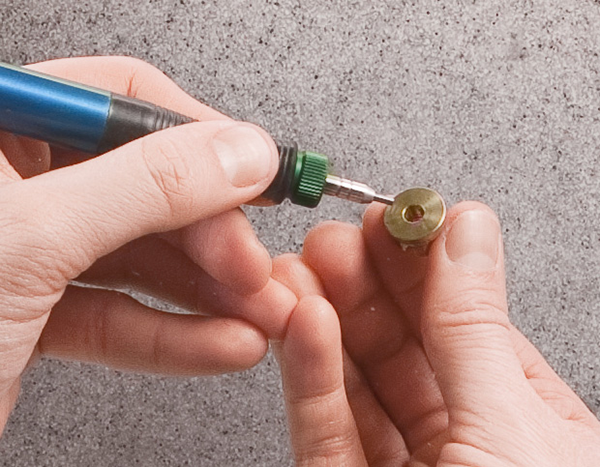 Certain softer abrasives, like Sodium Bicarbonate, remove burrs quickly without damaging the underlying surface. What’s more, Sodium Bicarbonate is water soluble, making clean-up simple. The challenge of burr removal is compounded by a surface finish specification that optimizes flow characteristics, which means abrasive selection is critical. Sodium Bicarbonate is sharp enough to attack the burr but physically soft enough to avoid texturing the valve. Glass Bead in an abrasive stream transfers energy to the burr, breaking it without cutting into the base material.